My body fills with excitement despite the five hours of sleep after a long night of work. Four months of training, all for this day. There is no way I am hitting snooze. I debate with myself whether or not I should wet my hair and clean up a bit. I will be out in public... but these people are runners so they understand... but it will only take a second. I dunk my head under the shower-head and get it over with. "Ahh... That feels better." I grab a granola bar, drink some coffee, finish my routine, and head out the door. I started running four months ago. After taking note to my parents and their new found love of running, I decided to give it a try. It was late one night at the library. I had been studying for finals for five hours and my mind was starting to wander. Old thoughts of running stormed through my head. I was remembering my track days in seventh grade. I was remembering my awful shin-splints, staring down at my shoes, and wondering why the pain never went away. 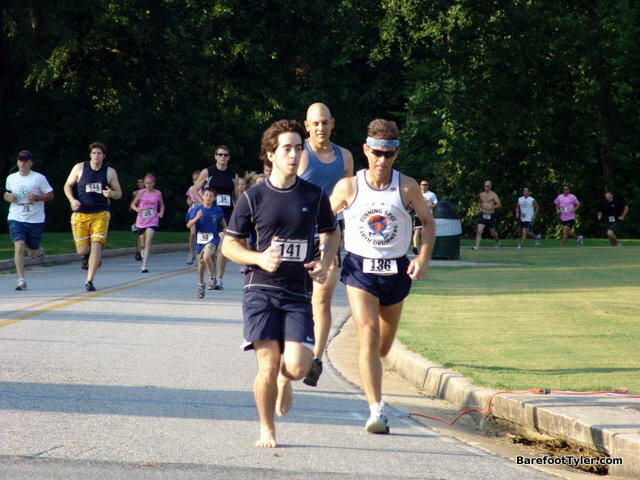 I also, for some reason, remembered reading an article about barefoot running and its advantages. "Hmm... Well I am at school, without running shoes. I suppose I could try out the barefoot running thing..." I read multiple sites about barefoot running form and such, then went out and tried it. I ran one quarter mile lap and I was hooked. I decided not to run too far to avoid any chance of injury, but I wanted to try it again. 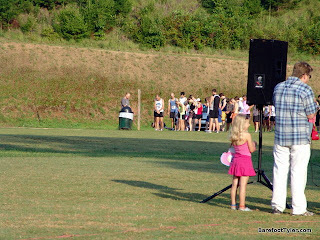 I set my goals on the Savin' The Girls 5K hosted at Yahoola Creek Park in Dahlonega, Georgia on June 27, 2010. I have been barefoot running ever since. Four months later Dave and I are lined up at the front of a pack of runners. I have ran one 5K before, and took some notes. I know that if I am not in the very front of the pack, on the start line, I will have to weave through the walkers. I tell Dave this. We both agree to start out in a sprint just to get ahead of the pack, then go from there. Dave began running with me about a month ago. He picked up on the sport nicely, ran for two weeks, hurt his neck, didn't run for a week, and ran for the fourth. He told me he was running the Yahoola Creek race. I told him I was going to go hard on that race, but would like to meet up with him there and hang out. The race coordinator counts down, "Three, two, one... GO!" I take off, leading the pack. Running beside me is a middle aged man. I know he is more experienced than me. His pace, his breathing... I don't know about this guy. Within a quarter mile he is ahead of me. We plummet across a wood bridge, hit some light gravel, and start on a heavily graveled trail. I knew we would be running over this section. I clear my mind, watch where I step, and take each step carefully. I try to keep my pace up. The middle-aged man has broken away from me. Behind me, I hear nothing, but I know the others are coming. I keep my pace up, make my way to the asphalt, and make a sharp left. I can see him again, forty feet in front of me. I get the feeling he is probably going to beat me. I quickly snap out of my thoughts. I have close to sixty people behind me. Worrying about the one in front of me isn't going to do me any good. Second place is really good for how long I have been running. I just need to keep my pace up and try my hardest. Second place is fine. Regrets are not. I tell myself to just run and not give up. We run over the bridge and take a right. I know this area better than anyone else there. THIS IS MY SPOT! I haul up the slight incline and head back to the start point. We pass the finish line at 10:10. My body is drenched. I have been pushing hard and I'm starting to feel it, but there's NO WAY that we are finished. I ask, "How much longer 'till the finish?" She responds, "You have to go around again, then you'll be done." I smile and say, "Okay!" and run on. After hearing that news I am slightly frustrated. The map didn't show two laps, but I guess if I came here to run, I better do it! I push on, crossing the same bridge and hitting the gravel. At this point in the race my adrenaline has decreased and I can actually feel the gravel a bit more. It's not so great. I should have trained more on this gravel. "Go! Go! Go!" I tell myself. I hear the crunch of a shod runner behind me. Darnit! I have to go faster! I step on the asphalt and run as fast as possible. The runner behind me, a sixteen year old in orange shorts and no shirt on, is next to me. We run side by side. I am tempted to say something nice and encouraging like, "Good pace! ", but keep my mouth shut and just run. The kid and I approach the bridge and I pull away. I get the feeling he was sprinting. If I just keep this pace I can get second. At this point I am weaving in and out of the walkers that are still on the first lap. They are very courteous and respective of the runners. They all seem to be keeping an eye out for runners. I hear a woman exclaim, "What do you mean we have to go around this again?" I crack a smile. Around the turn that leads back to the circle I sneak a peek of the kid. He is ten feet behind me. That is nothing at the end of the race. I slightly pace myself at my already-faster-than-usual pace and aim for the finish. I hear him behind me as we go down a slight incline. I hear heavy breaths on top of stomps behind me. I think, "He is only slowing himself down by stomping the ground." I remind myself of my last 5K, where I was the slow one going down hills. Now the tables have turned and I am at an advantage. My feet graze the ground as I conserve my motion. We hit the circle. I can see the finish line but I know I am no where near done. I am going to have to pull something to keep this kid off me. I wait until there is about half a lap. I try to anticipate his comeback. When is he going to do it? When is he going to sneak a sprint? I run. C'mon! Do it already! His breaths get closer. I run as fast as possible. My legs are burning and my mouth is pumping in air. I hear the same behind me. His heavy breaths follow mine. This is anyones race. There is less than a tenth of a mile left. I run. I really run. I put everything into it. He is getting closer. I can't let him catch me. I hear something. The sounds of glory? Maybe, but those are definitely the sounds of dry heaving. He is running so hard that he is about to puke! I keep running. The dry heaving continues, but he keeps going. I feel myself pull away in time and cross the finish line at 20:51. Eight seconds later, he does. I calm down and walk around. I grab some water and go straight for my dessert, the grass. See, barefoot running doesn't hurt, but grass feels awesome! I ask myself, "Could I have run that race any better? Do I regret anything about the last twenty minutes and and fifty-one seconds?" Nope. I am happy. Four months of training and hard work allowed me to get the best time I have ever achieved on a 5K. To say I was happy was an understatement. Dave finished at 25:51! In my opinion, this is a great time for someone who as only been running for a month. After the race Dave and I meet up with some of his friends and talked. I speak with the kid that finished behind me. I congratulated him and talked barefoot running with his parents. I look off in the field and see my parents. I say, "I'm already done." They laugh and ask me how I did. I tell my dad I owe him a dollar. Here's the deal. My dad told me he would pay my race fee, $25. For every place I lose I owe him a dollar. If I win, I don't owe him anything. Pretty sweet deal unless you get stomped. My dad asks me who beat me. I said, "Some older guy." and pointed off to the winner. We approach him and my dad asks, "What was your time?" He responds 18:56. My dad, impressed, laughs, and we start talking. 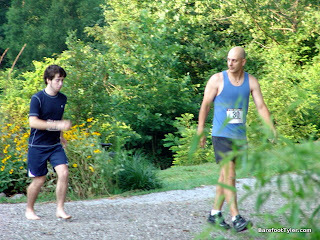 The guy thinks its cool that I ran barefoot. He says, "Yeah in that gravel section you didn't even have a chance." I laugh, because it is true. I tell him about the deal between my dad and I. He says, "Well, I respect the fact that you ran it barefoot. I'll give ya a dollar for that!" He runs off and returns with a dollar and runs away. I hand it off to my dad. The deal is done! I recollect my morning and the past four months. I am pleased with myself. This doesn't happen often, so it feels extra good. I head home to relax. I am happy. Thanks! I was shooting for some quality entertainment. I will try!